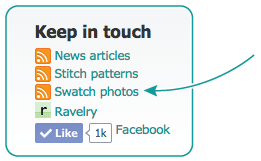 Finding out what’s new at Stitch-Maps.com just got easier. The “Keep in touch” section at the bottom of each page just got a link for a new RSS feed. Add the Swatch photos feed to your favorite feed reader, and you’ll get notified anytime someone contributes a swatch photo. Pretty slick, eh? This new RSS feed joins the News articles and Stitch patterns feeds, which – no surprise here – let you know about the latest news articles and stitch patterns. Myself, I watch all these feeds with the Netvibes feed reader, but I understand that Feedly is pretty popular too.